We know there are some times where pads and rolls just aren't what you need – for those times, we offer a wide range of universal loose sorbents. Choose from our variety of sizes and compositions to find the right fit for your needs. Visible color change signifies complete neutralization of acids; absorbs and solidifies liquids. Environmentally friendly. Handy 2-pound shaker makes it easy to transport and dispense Sorbent. Not for use with hydrofluoric acid. Visible color change signifies complete neutralization of acids; absorbs and solidifies liquids. Environmentally friendly. Handy 2-pound shakers make it easy to transport and dispense Sorbent. Not for use with hydrofluoric acid. Visible color change signifies complete neutralization of acids; absorbs and solidifies liquids. Environmentally friendly. 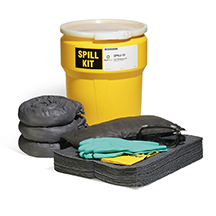 Handy 5-gallon pail makes it easy to transport and dispense Sorbent. Not for use with hydrofluoric acid. Lite-Zorb Loose Cellulose Sorbent is fast wicking, non-abrasive and non-toxic. 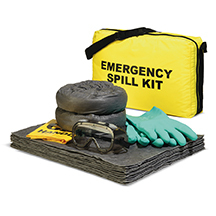 A great choice for fast and efficient response to leaks and spills in almost any situation. Absorbs oils, coolants, solvents and water. Universal absorbency — takes in oils, coolants, solvents and water. Made from all-natural coarse corn cob — much lighter than clay. Approved by the U.S. Department of Agriculture's (USDA) BioPreferred program, a federal purchasing program for biobased products. Super-concentrated formula absorbs 10 to 12 times more than clay. 300% increased absorption capacity reduces cleanup time. Environmentally safe. Universal absorbency — takes in oils, coolants, solvents and water. Handy 28-ounce shaker makes it easy to transport and dispense Sorbent.